Telestrut and Telespar are telescoping square tubing profiles that can be used in a wide range of industrial applications. The Telestrut line is custom designed to work with Unistrut Metal framing P1000 profiles. 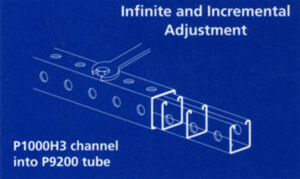 The Telespar line ranges from 1″ to 2.5″ in 0.25″ increments. Check out the links below for more information on Telestrut, Telespar, and Telescoping Sign Posts! 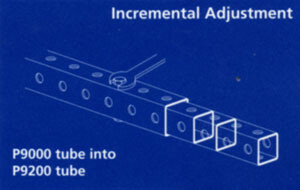 Telestrut is 1-5/8″ and 1-7/8″ square tubing that is uniquely designed to allow Unistrut P1000 channel profiles to telescope inside the 1-7/8″ sections. By joining infinitely-adjustable three-sided channel with incrementally adjustable, pre-punched four-sided tubing, the Telestrut system can be telescoped, spliced, adjusted, and re-used faster and easier than anything else in its class. Telespar square tubing is available in solid or perforated tube sections. Telespar standard tubing comes in eight sizes, from 1-1/4″ to 2-1/4″ square, in 10 or 12 gauge material. The perforated holes are 7/16″ and spaced 1″ on centers, except for the 1-1/4″ which have 11/32″ holes on 1″ centers. The Telespar system is ideal for racks, shelving, conveyor systems, and many more applications. The Telespar System is available with two types of posts: galvanized steel tubing with peforated holes on all four sides and Qwik-Punch posts, which are made with 7/16″ Knockouts on all four sides. The tubing is produced in a unique manufacturing process that permits tubular sections of different sizes to telescope into the next larger size. It is complemented by a variety of compatible fittings, nuts, bolts, and installation tools. 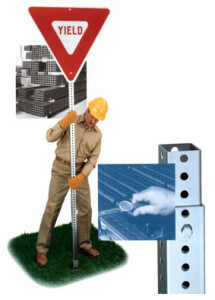 Unistrut Midwest carries Concrete Sign Bases for applications where driving an anchor into the ground is not possible. Click here for more information on the Concrete Bases! Unistrut Midwest carries the most common Telespar profiles in stock. We carry 12 gauge, 14 gauge, and Qwik Punch tubing. Contact us today to request a quote!